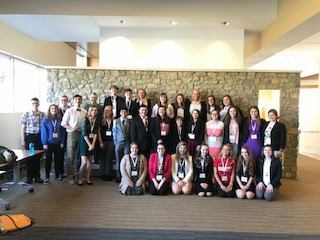 The Perry Local School District is recognizing several individuals who recently competed at the Educators Rising Ohio State Conference. The competition took place March 15 and 16 at Ohio Dominican University in Columbus and earned a number of impressive accolades. Over 800 students participated in the state competition with 30-40 competitors in each event—the highest number of participants in the conference’s history. Additionally, Perry Teacher Academy students Josiah Bracken, Blake Browning and Hannah Marino were conference presenters, and Halle Wright and Hayli Howard were selected as Educators Rising Ohio Ambassadors. The competition incorporates numerous performance-based competitive events in which teenage, aspiring teachers demonstrate their knowledge, skills and leadership in education.